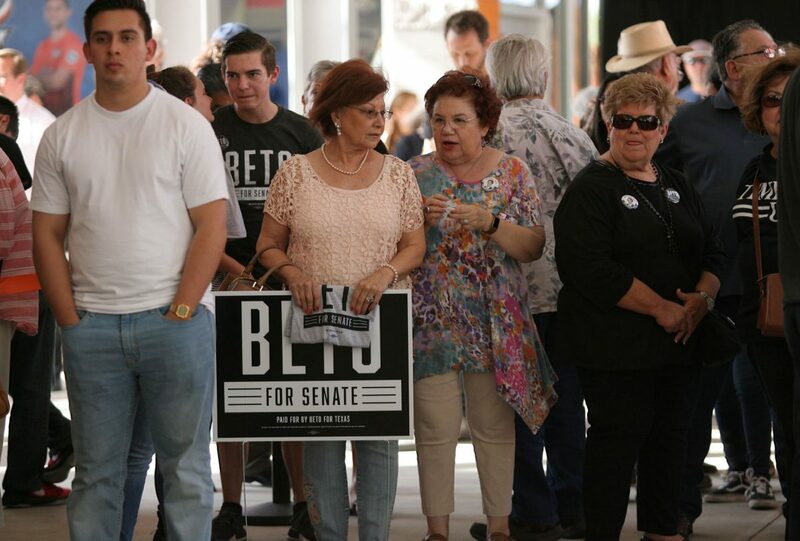 A crowd gathers at H-E-B Park in anticipation of meeting Senate candidate Beto O'Rourke in Edinburg on Tuesday, May 1, 2018. EDINBURG — The same day Democratic Senate candidate Beto O’Rourke confirmed he sent a letter challenging Incumbent Republican Sen. Ted Cruz to six debates, including two in Spanish, O’Rourke stepped on a stage here with a mariachi band before a rally of 350 people. With supporters shouting “I love you,” O’Rourke dove into the national issues that are manifesting in the Rio Grande Valley. By the end of his roughly 20-minute speech at H-E-B Park, his button-down shirt had more wet spots than dry on the muggy late Tuesday afternoon. He stood next to the stage and listened to local musicians Bobby Pulido and Little Joe of Little Joe y La Familia. 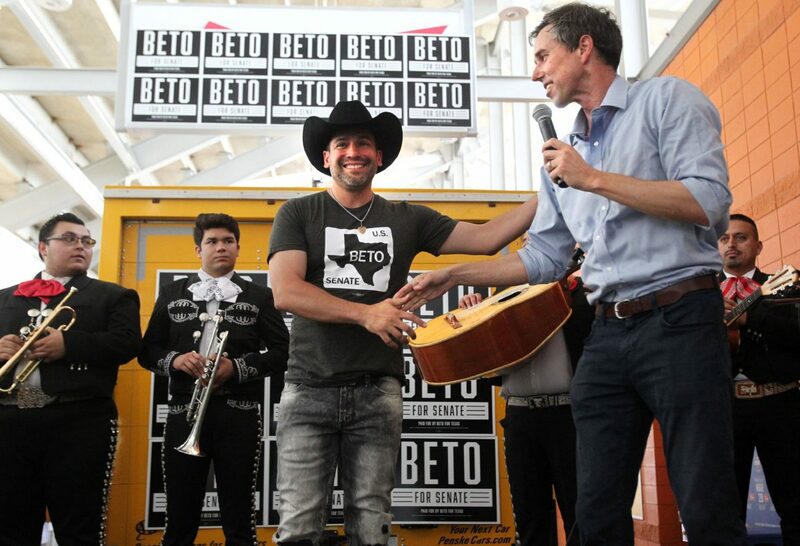 Edinburg Tejano singer Bobby Pulido joins Senate candidate Beto O'Rourke at a rally at H-E-B Park in Edinburg on Tuesday, May 1, 2018. Little Joe Hernandez of Little Joe y La Familia campaigns with Senate candidate Beto O'Rourke at H-E-B Park in Edinburg on Tuesday, May 1, 2018. 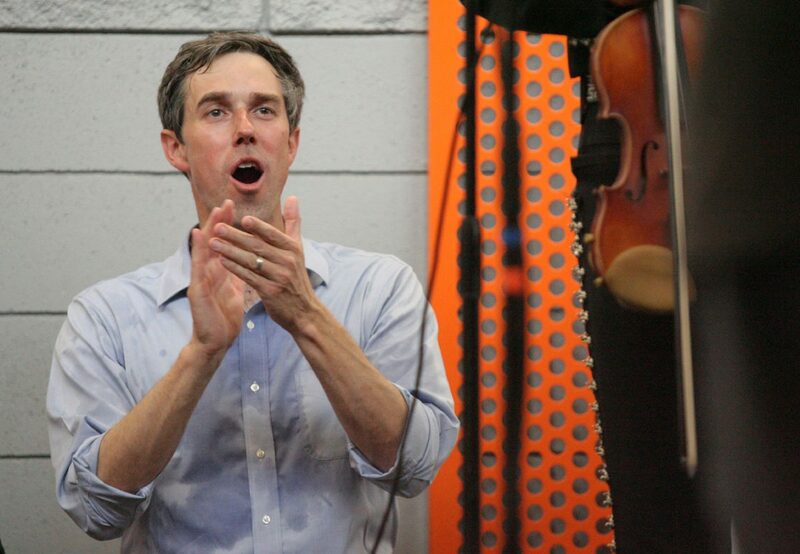 Beto O'Rourke cheers as he listens to Bobby Pulido sing "Desvelado" during a campaign rally Tuesday, May 1, 2018, at H-E-B Park in Edinburg. 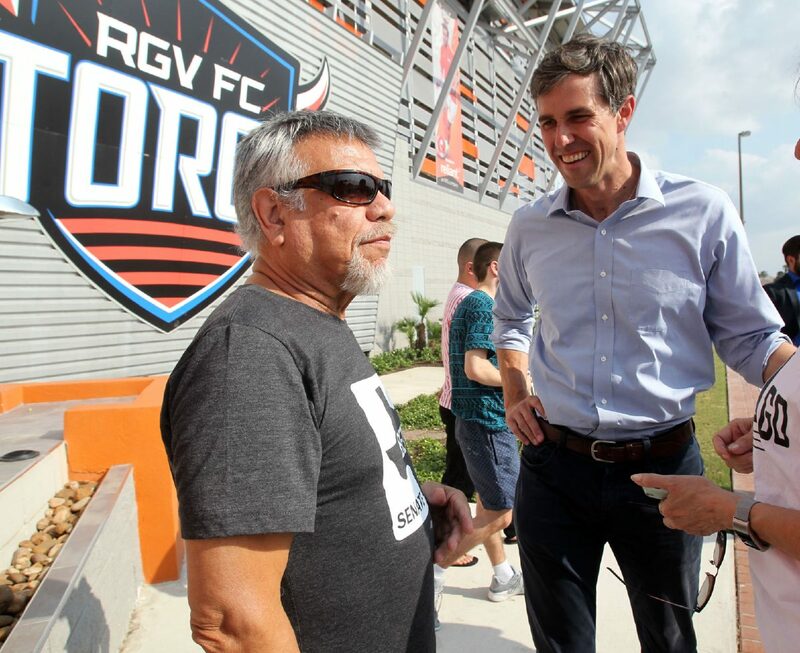 Once the music stopped, O’Rourke climbed the stairs for a view of the field where the RGV FC Toros play. Soon after, he attended a fundraiser hosted at the ranch of the Toros’ owner and Valley construction mogul Alonzo Cantu. That would be his last stop on a whirlwind day that started at 1848 BBQ in Brownsville. O’Rourke met with local leaders at the intimate gathering in Brownsville, with the candidate mostly listening. Brownsville Mayor Tony Martinez, U.S. Rep. Filemon Vela, D-Brownsville, state Rep. Eddie Lucio III, D-Brownsville, Cameron County Sheriff Omar Lucio and Cameron County Clerk Sylvia Garza-Perez, among about 10 others, gave O’Rourke ideas and feedback at the new barbecue joint. Afterward, O’Rourke held a town hall meeting at Brownsville’s lone Veterans of Foreign Wars hall in front of 250 people, according to his campaign. U.S. Rep. Gene Green, D-Houston, was on hand to introduce him, as was O’Rourke’s campaign comrade for the week, former El Paso County Judge Veronica Escobar, who gave up her post to run for O’Rourke’s El Paso congressional seat. Escobar won the March Democratic primary and is favored to win the November general election. But Vela, in front of his home crowd, received the loudest ovation during introductions, especially when reiterating his strong distaste for President Donald Trump and his proposals. “I think everybody here knows how outspoken and emotional I’ve been about President Trump’s border wall,” Vela said, drawing loud ovations. “And him spending Department of Defense dollars to send National Guard people here. And I know that sometimes I need to take my emotions and bottle them up, but it’s very hard for me to do. Then Vela delivered one of only a few mentions Tuesday of O’Rourke’s opponent, Cruz. “That’s why I know that the right thing for the state of Texas to do is to send Ted Cruz walking out that door,” Vela said. O’Rourke, who took the microphone soon after, barely mentioned Cruz at the VFW. He focused on the border wall, immigration, trade and veterans. The venue was an appropriate place to discuss veterans, and O’Rourke sits on the House Committee on Armed Services. He fielded questions about veterans and about working across the aisle. He’s already worked with his potential Senate counterpart in Texas, he said. O’Rourke’s debate challenge was announced Tuesday after the Democrat’s campaign manager proposed in a letter to the Cruz campaign that details of any potential debates be worked out between now and May 10. Cruz previously said he is open to debating O’Rourke.